If you have say an Elgato box, and want to watch your recording on your iPod, you might want to use the Season feature of iTunes to collate all the episodes together.You can do apple-I which shows the metadata, but this only allows you to change a recording at a time. Much much better would be a way to batch / bulk edit the metadata. The very excellent Doug Adams has created an Apple script that does exactly that. Download from dougscripts.com/itunes/scripts/ss.php?sp=setvideokindofselected , and place in your library, usually ~/library/itunes/scripts. You get a dialog which you work through. 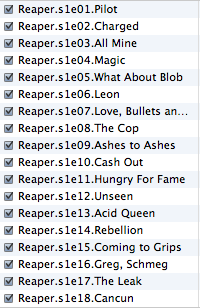 The episode numbering sequential, Brilliant! click done, and the script goes to work. One thing to note is that iTunes re-writes the files back to source, which means it can take a very long time if you do a lot at once, and iTunes will appear to have crashed. Have faith, and if you can monitor the folder where the originals are: you'll see each file in turn change its modified time. Eventually the operation will complete. 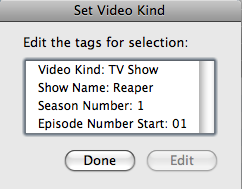 To do Reaper Season 2 took 1.5 hours!